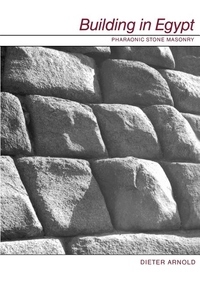 This book traces methods of Egyptian stone construction during the pharaonic period, from the construction of the step pyramids at Saqqara to the obelisks of Tuthmosis III to the temples of Rameses II at Thebes. Dr. Arnold covers all aspects of building, including planning, measuring, quarrying and production, transporting heavy monuments, building, digging shafts, repairing damages, and securing tombs. Richly illustrated with photos and field drawings by the author, ancient representations of building activities, and illustrations of tools and objects in museum collections, this book offers a frank appraisal of current knowledge of the process of Egyptian stone construction.